Twinhead Theatre�s most popular event returns�and this time, it�s scary. Cakesit 3 is a double feature parody spectacular sure to shrivel your sugar cubes, from the haunted oven and creepy clown in Pastrygeist to the violent crave zombies in 28 Cakes Later. Twinhead brings you your favorite movie moments, scored live by STREZO and featuring cardboard puppets, song-n-dance numbers, multimedia magic, and gore galore. Make that the new streaking for charity, because every year Cakesit collects tons of canned goods to help replenish the Atlanta Food Bank�s stores after the holidays, and half the monetary profits go to Eyedrum to support its programming. 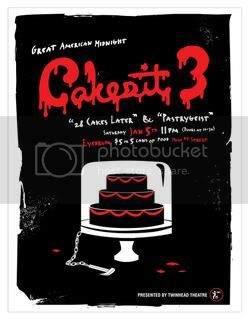 Cake, charity, horror film parodies�what more could you ask for? Come on down to Eyedrum and sink your cheeks. Saturday, January 5th, 10:30 p.m. $5 or 5 canned goods. Features a bake sale, with both cakes for sitting and cakes for eating.